The Rhodia Webnotebook (or, as people online have dubbed it, the “Webbie”) has an asinine name, but that name shouldn’t prejudice you against the object itself, which is the best notebook I’ve tried since switching away from Moleskine. Numerous rapturous threads are devoted to this notebook on the Fountain Pen Network (“FPN” to the regulars), which is one of these sites that prove how well-suited the Internet is to connecting people with bizarre, niche hobbies to one another. Being one of those people, I say that with affection. Many, many FPN writers are ecstatic at the prospect of a mass-market notebook whose pages will not let ink bleed through. Ink bleed was never a problem with Moleskines for me, because I use extra-fine nibs and apparently don’t use inks that saturate paper like rivers do handkerchiefs. Regardless, the Rhodia’s paper is excellent. It’s supposedly acid free too, so the paper won’t degrade before you do under normal use. I’m happier about the durability: I’ve used three Rhodias. None have come close to breaking. A Moleskine broke (though many earlier ones didn’t). An insanely expensive Design.Y notebook broke. A Leuchtturm 1917 has perforated back pages and will probably break. The Rhodia isn’t perfect. The lines are spaced slightly too wide, at 6.35 mm per line (or .25 inches); they might be great for someone learning how to write, but for someone who already knows, they’re not as useful, and it’s harder to connect ideas on one page to ideas on another. 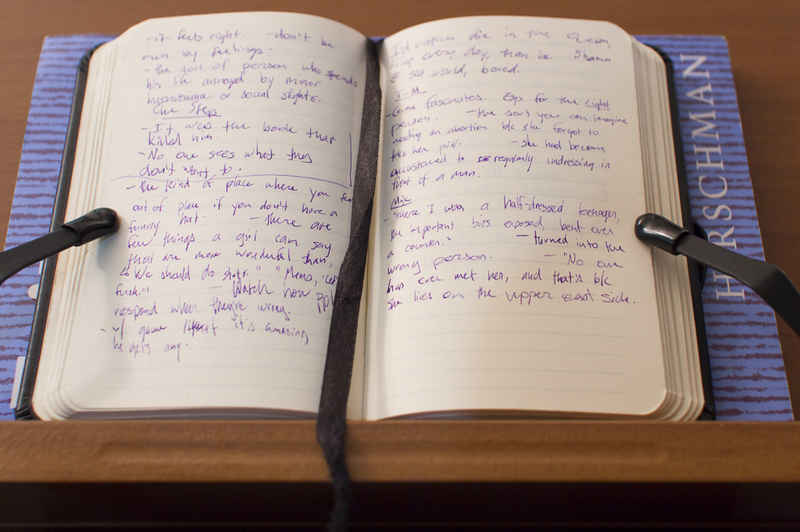 An ideal notebook should be closer to 6 mm per line. Moleskine gets this right. The edge of the cover should be flush with the paper, not a couple millimeters out, forming an unsightly lip. The lines should run to the edge of the page; the current design wastes space, and this is the most important design flaw in the Webnotebook. They’re small problems that I’d like to see addressed but that don’t detract from the big things. Speaking of size, you can also buy A7-sized notebooks (which are about 4.7 x 3″) from Europe or Australia if you’re willing to pay the obscene shipping. I am, because they’re perfect. I sent an e-mail to Goulet Pens to ask if they could get A7 notebooks, and Sam Vaughn responded to say that they “can do a special French order for them,” but “when ordering direct from France we have to order by the carton which in this case would be 40 notebooks.” Alas, 40 notebooks would probably be $500 and last for decades. The A7 is a more pocketable size than the 3.5 x 5.5″ American version. Choose it if you can. Then stop looking and start writing. EDIT: Rhodia makes much larger, 5.5 x 8.5 notebooks as well. I don’t have any use for them, but visual artist types might. It’s great to see someone pushing for the A7 size. I looked at an A6 size and ended up going with the 140x90mm because it seemed to fit better into most back pockets.